HAW now supplies lightweight 700 bar hose with high abrasion resistant covers. They have a 4:1 safety factor and burst pressure rating of 2 800 bar. Hydraulic and Automation Warehouse (HAW), a member of the Hytec Group of Companies, now supplies 700 bar hose, mainly used on hydraulic tooling. These hoses are lightweight and have high abrasion resistant covers. A significant step up from the standard hydraulic hose imported by HAW, the company now manufactures hose assemblies with this niche hose, which has a 4:1 safety factor and burst pressure rating of 2 800 bar. The hose core is constructed from thermoplastic elastomer and has a polyurethane covering, consisting of one or more braids of aramid fibre and one braid of steel wire. The hose can be used in environments ranging from -40° C to 100° C, although, 70° C should not be exceeded when transferring air and water based fluids. The hose is ideal for very high pressure lines in compact hydraulic systems operating at 300 to 700 bar. 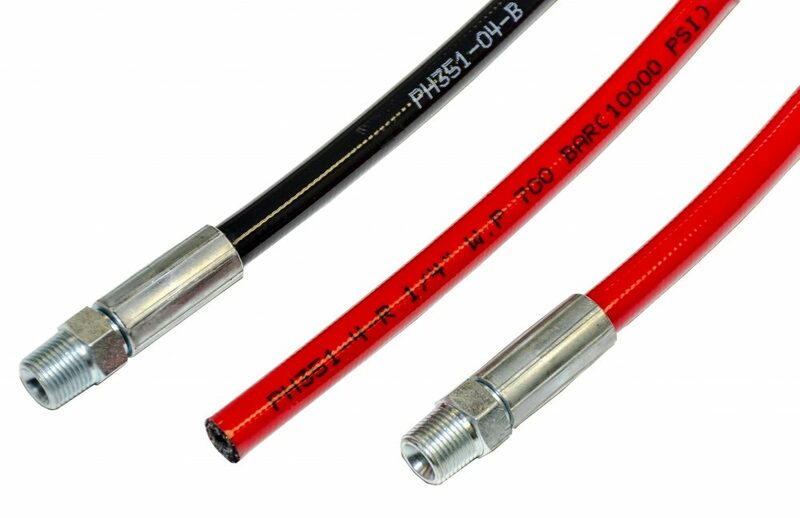 Commonly used with rescue and safety equipment, the low change in length means that the hose can be used to transfer petroleum, synthetic or water based fluids in hydraulic systems. Available in both 6.4mm and 9.5mm diameter sizes, the hose comes in a range of colour options including black, red and light blue hose covers. There is no difference in specifications between the various colours. HAW also boast its own test facilities, meaning that all hose assemblies can be subjected to static hold pressure tests upon request. HAW prides itself in its high stockholding of this hose range, which is accompanied by hose fittings and protective springs for this hose. All fittings stocked are 1/4″ and 3/8” NPT male and HAW also stock 700 bar quick release couplings that work hand-in-hand with the hose assemblies.